Aside from oxford shirts and tunics, lately I really love the look of slightly loose, flowy feminine blouses in fun patterns. They balance out the long lean lines of skinny jeans and denim leggings nicely, look a lot dressier than tees and tanks but don't require any more effort to wear, and disguise a full belly after a big meal--all major selling points in my books. But it's hard to find a pattern that's really appealing. I saw this blouse at the Forever 21 in Union Square, NYC, one night, and by the time I went back the next day they were down to mediums only. I'm usually a small but because of the blouse's voluminous fit the size difference was negligible. I liked the pattern--a mixture of black, burnt orange, and blue Pollock-esque splotches on a cream-coloured background--too much to put it back anyway. Since then it's been worn a multitude of times. Super cute! Prints are truly magical in their ability to pull together an outfit. Adorable blouse! You really rock that print! I feel blouses like this are definitely the best way to dress up jeans but still look casual enough for a day out. And I loved your last comment by the way - couldn't agree more! This looks like a familiar outfit ;)?!?! I can't believe we never took any group photos that night...what a rookie mistake! Anyways, glad you did an outfit post because I was meaning to ask you where you got that gorgeous blouse! Forever 21, what a find!! For some reason, I have been favouring flowy over slightly form fitting blouses these days too! I feel the same way about flowy blouses too, especially the part about hiding a belly after a big meal haha! The print on this one looks pretty but not too overbearing-- love it! I love flowy printed blouses as well. This one is really cute. Such a beautiful print...and those boots are most delicious! Now, that's a cute blouse! You're right, a flowing, flowery blouse is a nice contrast to the stark lines of skinny jeans! a very versatile top - with shorts like you have here, skinny jeans or a high waisted skirt. i love especially wearing fuller, billowy blouses with something tight on the bottom =). a yes, great for when you have to eat large meals! That is a super cute blouse! 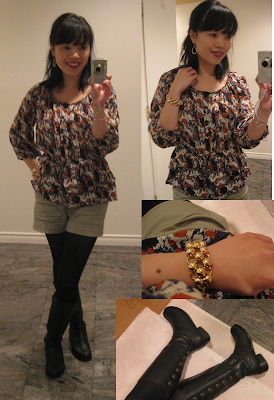 love the print, it's very fall :) You definitely can't go wrong with loose, flowy blouses - they're my favourite!